Every Mac owner should be using Time Machine, it’s by far the easiest and most painless backup solution, running in the background and allowing for easy recovery of files or the entire operating system should something go wrong during an OS X update or otherwise. There’s no way around it, having backups of your Mac is critical, and advanced users may benefit from scheduling the Time Machine backups. Scheduling Time Machine backups on a Mac is useful for many reasons, whether for management or administrative purposes, or simply because you want to change how often the backups occur. For example, Time Machine can be a bit aggressive sometimes, and by default it backs up all changes every hour that a drive is connected or within range. While that is great for backup purposes, it can be a nuisance when it hogs disk I/O and CPU cycles from other tasks. The easiest way to avoid this is to adjust the backup schedule. Whatever the reason, we’ll show you how to adjust backup schedules from the Terminal, or with a super easy to use Preference Pane called TimeMachineScheduler. Using the command line and a defaults write trick, you can manually adjust the Time Machine backup schedule. To get started, launch Terminal and then adjust the command sequence as desired. Hit return and the default backup schedule will be restored again. The Terminal method is a bit advanced, meaning it’s better for users who are comfortable with the command line. It works in all versions of Mac system software, including OS X Yosemite, Mavericks, Mountain Lion, Snow Leopard, etc. But if you don’t like the command line, or if you want more control over when Time Machine runs, your best bet is the free TimeMachineScheduler app for Mac OS X.
TimeMachineScheduler works with Mac OS X 10.9, 10.8, 10.7 and 10.6, and allows for simple and precise controls over when Time Machine runs. Just as with the defaults write commands, you can adjust the backup interval, but perhaps most useful is the ability to skip backups between scheduled times. Don’t want Time Machine to run during your peak productivity hours of 9am and 2pm? Set the time period to block in the app. TimeMachineScheduler also lets you restrict backups only to a specified network connection and SSID, which is a great touch for those who use Time Capsules or backups over wifi. Heads up to The Graphic Mac for finding TimeMachineScheduler. Do you schedule your Time Machine backups? Do you let them run their course? Do you start and complete backups manually? As long as you’re backing up your Mac on a regular basis, you should be good to go. I know it’s been a while…are you still using/still happy? Yes I am using this on Yosemite and its working fine. As a MacBook pro owner there is I found out last week a hidden file that portable Macs use to back up when not attached to Time Machine. Can you write an article on this feature and what happens to it after a portable is attached to Time Machine and has finished backing up. Time Machine is a bit aggressive, and backs up all changes every hour that a drive is connected or within range, this is great for backup purposes but can be a nuisance when it hogs disk I/O and CPU cycles from other tasks. Set the interval from 1 to 12 hours. • Run the backup manually or automatically also at startup, login or when the daemon has been loaded. • Display the status of the daemon, of the backup volume and if the backup is currently running. • Automount, an option to mount and unmount the backup volume automatically . 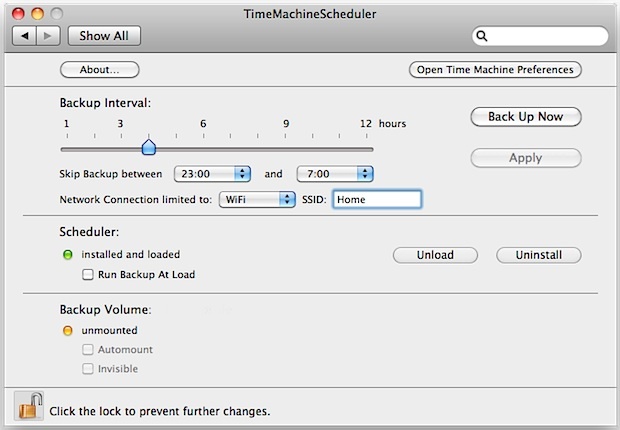 Time Machine Scheduler disables the automatic backup function of Time Machine. I think that you need to do a restart of the Mac to have this happen? — that is, the command-line version, not sure about the other one. This has changed in Mountain Lion 10.8.
my problem is, that i’d like to have a backup every 30 minutes, so i’ve tried the option with the modification in the command line, but somehow it is not possible for me to enter my password when it is required… Does anyone know why that comes, or if there’s another way to get the updates more frequently (which is not the case with the presented TimeMachineScheduler)? Does not ‘see’ my connected and mounted USB timemachine HDD. Maybe I’ve got the wrong idea, but I downloaded this app hoping that I could schedule once-per-day or once-per-week backups of my Mac server, but it looks like the closest I can get is running a backup once every 12 hours. The server only serves a single function, and doesn’t change much. Therefore I don’t really need to run backups twice a day. Is there any way to configure to only run once a day, or at longer intervals? On a related note, how do you tell Time Machine when it’s okay to overwrite previously-created backup files? If I do back everything up every 12 hours, then after a week I’ll have 14 backups, and I may end up filling my backup drive. I want to make sure free space is always being created by expiring the old backups for overwritability. Time Machine editor seems to work well for longer backup intervals. Can be configured for hourly, daily, weekly, etc. Try it to see if it fits your needs. The latest version works with OS 10.8. SO is TM funtionailty actually being replaced, or ‘edited’? Mo – Time Machine Editor actually only disables the Apple Time Machine menu bar icon. The times listed for “last backup” in that menu are accurate. Time Machine Editor actually takes control of the Apple Time Machine application, replacing it’s native settings (defaults) to modify the Apple Time Machine functions. it looks like you could schedule backups to run only within certain hours… for instance, give it a 2 hour window that it would backup in, and then set it to backup once per 2 hours – then it should only run once per day. Haven’t tested this out though. Does this same terminal trick (sudo defaults write /System/Library/LaunchDaemons/com.apple.backupd-auto StartInterval -int 14400) work in Mountain Lion? There are an option available in Mac Operating system through which you can easily schedule your Mac backup. Time Machine is a great backup utility which helps to keep incremental backup. However, Stellar Drive ToolBox has an awesome backup utility called’ clone’. You can easily create backup in the form of image or clone. So I am excluding them from the hourly time machine setup as they change every minute, it hogs the disk space. I’d love to have TWO schedules and setup so I can specify to backup my mail mbox daily rather than hourly. Hey can you update this article for El Capitan? The sudo command no longer works. Partly that is because El Capitan is rootless, but even if one enables root, the command still doesn’t work. Disable rootless first if you wish to change Time Machine scheduling in El Capitan. How do I uninstall it. I want to go back to manual weekly backups. We are a group of around 30 people backing up to the same server. Now our admin asked to reduce the backups to once per day instead of every hour to reduce the traffic between the server and all the macs. Is there a way to keep my macbook pro performing hourly backups but just sending them once per day to the server and in the meantime storing them locally? Ma no! Time machine is not a backup service. It is your machine personal backup. And not even a backup. What it cache per hour is simply lost on a computer crash. Namely: no backup. So any speculation on backups is simply useless. And funny enough it is the best service of the time machine which fails to be named a backup. The 1 hour backup cycle. As it is backed up on no external device. Now if you call you, handling disk, the administration, handling the same actual disk, a backup system. Beh.. I like other features of the time machines. I appreciate frequent backups, but also want older backups, for use in case it takes a while for me to discover a missing or damaged file. So if space is growing short, it’s not necessarily the oldest backup I want deleted. I want to ensure there’s always a backup at least a month old, and another that’s younger than a month but at least a week old. And I’d like to be able to add a tier, so I also have a backup that’s at least a year old. Is there a way to adjust the deletion policy? Note that you’ll need to disable System Integrity Protection to monkey with the file in /System/Library/LaunchDaemons now. I ended up editing the .plist file in Xcode. Is Time Machine Editor still a viable option (considering it was listed on here 5 years ago or so!). On a related note: how can I schedule my Photo uploads to iCloud to happen at off-peak times (similar reason: hogs line speed!). Ok, after changing the value for Interval manually it seems that Sierra still insists on setting it’s own backup schedule. Since I am constantly copying a bunch of big files and have no interest in Time Machine mucking around every hour or so, this leaves me with no other choice than to back up manually. If someone actually figures out how to get a fixed backup schedule, please comment. Perhaps some of the other values like GracePeriod, Delay etc. need to be changed too.